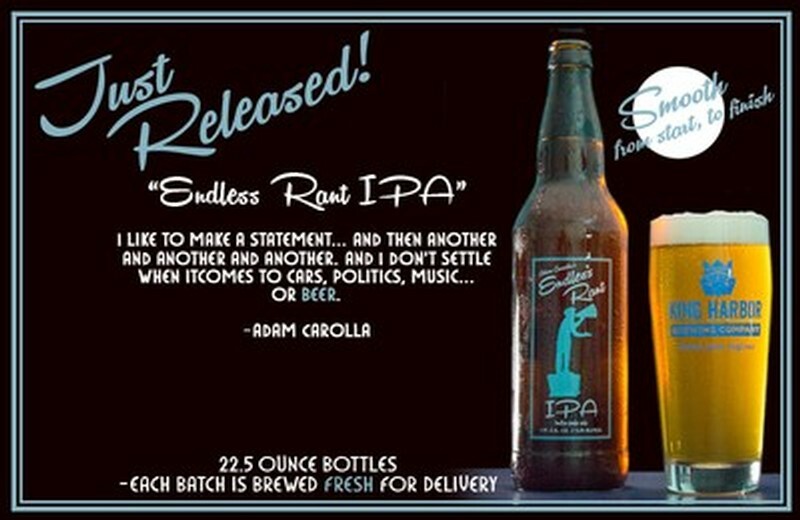 Let me be the first (or at least let me pretend to be the first) to introduce and welcome the newest member of the Carolla Drinks family, Endless Rant IPA! The first thing everyone seems to ask about the IPA is, "Where/how did you guys come up with that name?" I tell everyone the same thing, "Non-Stop Complainer IPA" was already taken. Ha, just kidding. In all honesty we wanted something that got down to the essence of Adam and his unique outlook on life. Adam, as we all know, is a world class Ranter, perhaps one of the best ever. His diatribes are the reason we have come to know and love Adam Carolla. We added the "Endless" monicker to pay homage to the fact that Adam always gets the feeling that no one is ever listening to what he is saying. Well, that's all about to change (probably not, but we can hope)! 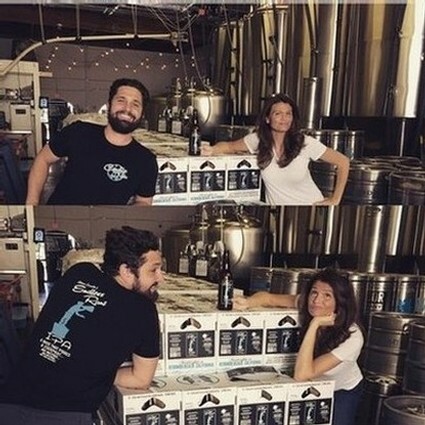 Adam and Lynette are enjoying the new brew and can't wait to share it with you. Endless Rant IPA is really damn good. I always get the feeling that being overly excited about your own product makes you sound like a cheese ball, but I am willing to take that risk. It has a balance of a classic West Coast IPA citrus and pine character and the new school fruit profile hops supported by a solid malt backbone and a clean bitter finish. Not to mention the 6.2% alc/vol allows you to enjoy a few. I am semi-new to the IPA game, but I have some knowledge of the category. This goes down easy, has a great aroma and flavor, and the bitterness is surprisingly smooth. Give it a try for yourselves and see if I am overselling or if I was exactly right on all accounts. 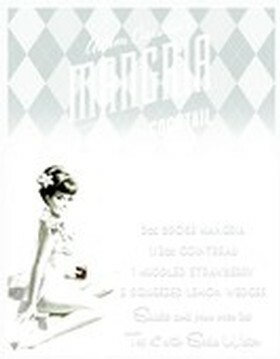 GET TICKETS TO MANGRIA PONG IN HOLLYWOOD! WHO plays Mangria Pong? For starters, if you have played Beer Pong, good chance you will have a leg up in Mangria Pong. 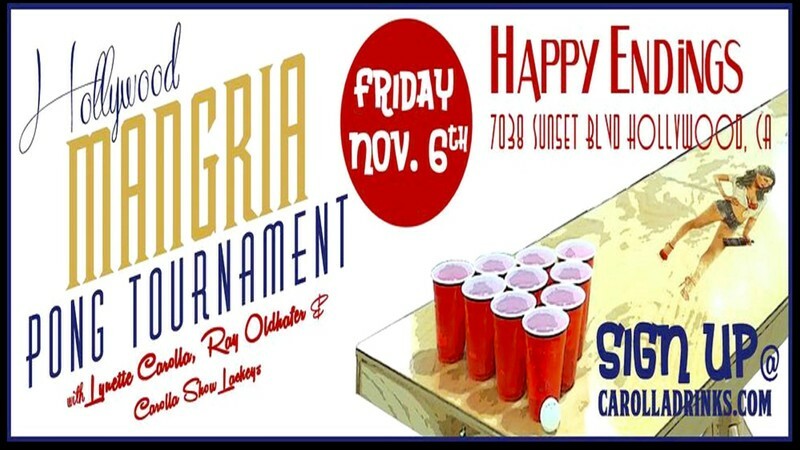 On November 6th at Happy Endings Bar 7038 Sunset Boulevard Hollywood, the question will be "Who doesn't play Mangria Pong?" Join The Adam Carolla Show lackeys and other friends of the show at Happy Endings in Hollywood for our First Annual Mangria Pong Tournament. The event starts at 7:00. Not a Pong Player? We will let you in anyway! Come for the pong, the fun or both! WHAT is Mangria Pong? It's the brand new game that's sweeping the nation...well, sort of. Mangria Pong is exactly like your traditional game of Beer Pong, only caveat is we use one of our Signature Cocktails made with Mangria. We had a couple of scrimmages using only Mangria and quickly found out that for longevity's sake, a Mangria cocktail made more sense...at least that's what I remember. WHY play Mangria Pong? For the same reason you sit at your desk and toss crumpled up paper into your trash bin and throw your hands up wildly into the air when it makes it...because we all like throwing things and cheering! Or, because it's going to be a fun filled evening of competition, laughs, and prizes! HOW to sign up to play? 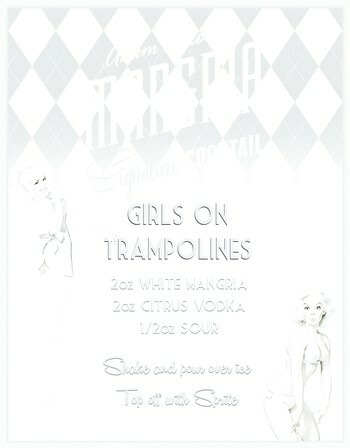 SIGN UP HERE or visit the Events page on Carolladrinks.com and click on the Mangria Pong ad in the calendar. Cost to sign up is $10 + tax. Included in the cost is your first Mangria Cocktail pitcher. There is going to be a lot of tough competition (my team primarily). Here's the Scoop on the San Diego Bar Crawl - JAY MILLER STYLE! Hello, my name is Jay Miller, a.k.a. "Assistant Jay". I started working for Adam and Lynette in January of 2006. I was referred to them by a friend of theirs who would like to remain nameless. However, I can tell you his initials are J. Kimmel, or Jimmy K. My job title was "house boy" and my days were riddled with dog walks, and grocery store trips. After a year I graduated to Assistant. 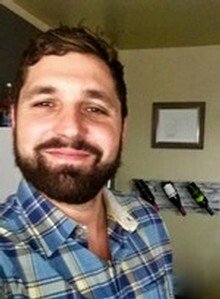 I went to work full time with Adam at KLSX radio station here in Los Angeles, and stayed with Adam when he transitioned to podcasting. In fact, I was part of the rag tag crew that built out his podcast studio where he currently does all the shows. In early 2012 I took a hiatus from Assistant work. In September of the same year Lynette reached out to me to see if I was interested in coming back to work with them in a different capacity, one that was geared towards building their new alcohol brand called "Mangria." So here we are. My role since then has not really changed, per se, however it has definitely broadened. I came on as a part-time sales representative geared towards reaching out to venues that Adam would be playing while on the road. We needed Mangria to reach his fans and it was my job to make sure it was available. I joined full-time in January of 2013 and have been working to bring Mangria to bars and stores nationally. This year has seen the advent of our newest marketing endeavor, the Mangria Bar Crawls. 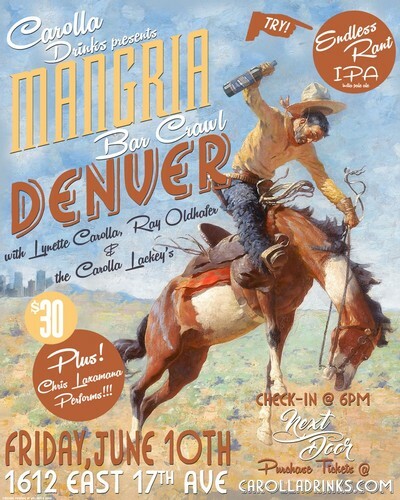 For those unaware of what the Mangria Bar Crawls are, they are a party on wheels to put it plainly. We select four bars in a participating city that would like our group of party goers to come to their fine establishments and enjoy different signature Mangria cocktails for an hour. We provide those in attendance with travel from each participating bar, either by Double Decker bus, or by charter. Drink and food specials are provided by each location for those in our group. We arrange it so that the first location acts as a check-in/music venue. Chris Laxamana, a.k.a. Maxipada provides musical entertainment while folks sign in. Bar Crawl paraphernalia is available for those that want to gear up. Right before we take the show on the road a Mangria toast is made with a complimentary Mangria shot for all those that came out. August 1st marked our second MBC this year and we had our sites on the lovely city of San Diego. We couldn't have asked for a better day. It was a beautiful Saturday afternoon/evening without a cloud in the sky. With Adam's tremendous help of advertising to the podcast listeners we were able to sell out the event at 110 attendees. 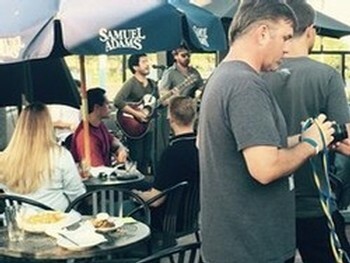 Stop #1 - Everyone met at 5:30 at Bridges Bar and Grill where Chris and his 3 piece band kicked off the night on the outdoor patio. Bridges was pouring our specialty cocktail, "The Better Man", and provided all with a great happy hour menu for food. This is the point of the night when anxiety is a little high because you want to make sure everyone gets in and gets their complimentary shot without any hiccups. Once everybody was checked in and got their bar crawl gear (if interested in a bar crawl tshirt let us know) things started to move a little easier. Lynette and Producer Gary gave thanks and raised everyone's glasses for the Mangria toast and the charter busses took us to Rosie O'Grady's. Stop #3 - Pal Joey's was the perfect third stop and this venue is part music venue part billiard hall. Folks were starting to let their hair down and mingle and Pal Joeys' allowed for a lot space for people to tell stories and have a laugh. Pal Joey's did not serve food, but that was ok seeing as how most had just devoured the tacos. They carried the "CosBROpolitan" (recipe to come). The band started right after we got there and there were some of our group out there trying to do their best to cut a rug. Before we knew it the hour was up and we were loading up to head to Junk House. Stop #4 - Junk House was a newly renovated location right near San Diego State University. They, like all the bars, were more than welcoming when we arrived. They had an entire section of their bar dedicated to our party and gave us a personal bartender. The cocktail of choice was the "Mahalo". At this point in the night all stress had been forgotten and there was only camaraderie between old friends and new ones made during the night. I can't thank all those that came out to the event enough. It was the fans of the Adam Carolla Show that made it a success. I hope that we can keep the momentum going and take the MBC's to more cities. Rumors are that there may be an east coast crawl in the near future.